There is an aspect of a truck driving job that is no different than passenger vehicle driving and that is being aware of your surroundings. The majority of accidents can be prevented by having good visual acuity. It is recommended that you look 12 to 15 seconds ahead at all times. When it comes to stopping or changing lanes, looking ahead allows you to ascertain if you have the time and room to make course changes. What happens if you do not look about 15 seconds ahead? If you are not prepared you may have to stop short (or too quickly) – which may cause a driver to might end up rear-ending the vehicle in front of them. 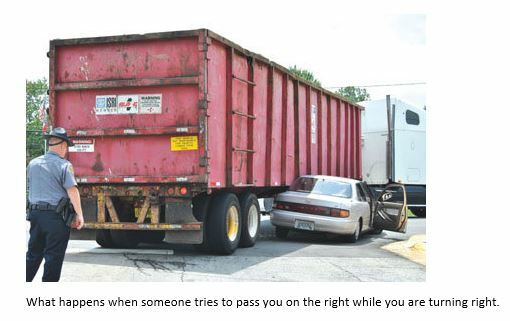 If the driver behind you is even a fraction of a second distracted, he could run into the back of your trailer. You can see that a chain reaction can quickly occur, especially during inclement weather. It can be a challenge to absorb everything going on around you, especially when driving in high-traffic states like California. You must be aware of other vehicles making lane changes, exiting and entering the highway, braking, passing, etc. This requires you to be diligent. You must be aware of what is happening ahead of you, alongside you and behind you. If you are driving an area you are not familiar with you also want to look at the road itself. Looking at the condition of the pavement, hills, curves, and other features is crucial to being an efficient driver. When driving through cities in Florida, for example, one must be aware of the different types of terrains they may encounter. Most curves will have speed limit signs if that limit is less than the straightaway portion of the road. 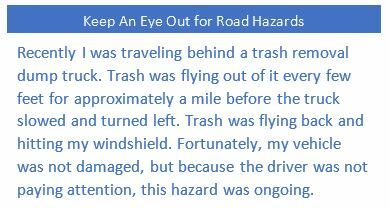 Keep an eye out for potholes, standing water, and/or objects in the road. Traffic signals are another thing to be aware of. A light that has been green for a long time is likely going to turn yellow, then red, soon. You want to be prepared. If you are traveling in a city, you can have a heads up on a signal change by observing the cross-walk light. If the walk light is blinking that means the traffic signal will soon be changing. Watch the speed limit signs. While traveling on I-55 from Illinois to Iowa in January 2017 I noticed how the highway speed limit fluctuated between 55 and 70 m.p.h. the entire journey. If you are not aware of your surroundings it is easy to miss a speed limit change sign. If the speed limit lowers, say to 55 m.p.h. and you are still traveling 65 m.p.h. you are at risk for being pulled over for speeding. Looking ahead is important, but so is looking behind you and to either side. This is how you keep track of the other vehicles on the road. If you have a white SUV behind you for several miles and then all of the sudden you no longer see it, you can assume that it is running up beside you in your blind spot or to close behind you and not visible in your mirrors. But you know it is on the road and you can make driving decisions based on where it could be. For instance, you can move over in your lane a few inches and check your mirror again to see if it is behind you, or you can wait 10 or so seconds and see if it passes you. Being this aware will keep you from making a course correction that could lead to an accident. Another reason to always be checking your side mirrors is to check your tires. You can potentially catch a tire fire if you are alert. You are also able to see if any of your cargo straps (or load on a flatbed) is coming loose. When going to make a lane change, it is presumptuous to just change lanes. It is true you are bigger than most vehicles, however, it is both irresponsible and rude to just change lanes and assume others will slow to get out of your way. Drivers should check their mirrors twice as much when going to change lanes as you do regularly. Be sure to use your turn signal also so those behind you understand your intentions and can drive accordingly. Visual alertness is not just your own acuity, but also using tools to help others drive defensively as well. This is in reference to using your lights and signals. Use your turn signal when making a lane change or physically turning your vehicle. When driving a passenger vehicle, it is easy to get into the habit of turning on your signal just before you turn, not using it when changing lanes, and holding the signal arm so that it’s on temporarily. These are bad enough habits for passenger vehicle drivers, they are disastrous for semi drivers. Three rules of thumb to follow are to signal early, signal continuously, and not cancel the signal too soon. You want to engage your turn signal ahead of the actual lane change or vehicle turn. This will alert other drivers to your intentions and will keep most drivers from trying to pass you. It obviously will not prevent all drivers from making illogical moves, but it will prevent most. Signaling continuously means turning on the turn signal and leaving both hands on the wheel during the lane change or actual turn. Once you have completed the lane change you can cancel the signal. After completing the turn many signals will automatically cancel, but not all. Be aware of how your semi performs and cancel the signal appropriately. Tapping on your brake pedal is actually a courtesy to the drivers behind you. It lets them know you plan on slowing down or stopping altogether. It is also a courtesy to turn on your four-way emergency flashers when you spot a hazard ahead. This lets other vehicles know something is wrong up ahead and can stop some of them from racing ahead of you just to have to cut you off while they slam on their brakes. Flashing your headlights is another courtesy you can pay to drivers. If another semi is passing you then when it is safe for them to move back into your lane in front of you, flashing your headlights lets them know it is safe to move over. It is a simple courtesy that nearly all truckers appreciate. Some passenger vehicle drivers know about this courtesy and likewise appreciate the heads up that you can see them and therefore it is safe from them to move back into your lane ahead of you. Drive with your headlights on at all times. It is a good habit and prevents you from being caught unawares when transitioning from daytime to dusk. Also, it is more difficult to see vehicles in the rain. Headlights can help reduce accidents by the fact that you will be easier seen. Though headlight rules may vary somewhat by state, Texas, for example, has a law that headlights must be on thirty minutes prior to sunrise and a maximum 30 minutes after sunset. There are numerous ways you can making your trucking job easier. Appropriately using your lights, signals and maintaining visual awareness are some of those ways. Drivers have one of the most important and yet stressful occupations in the country. 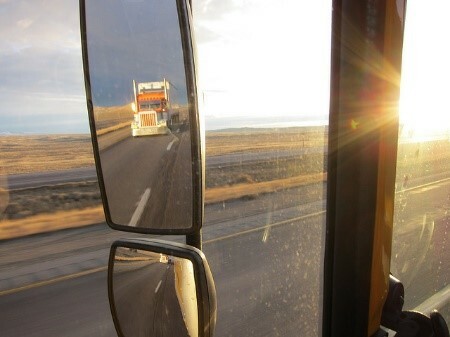 Anything you can do to enhance safety and prevent accidents will only make your trucker job more manageable. Never underestimate the effectiveness of simple things such as using turn signals, checking your mirrors regularly and knowing what’s going on around you.